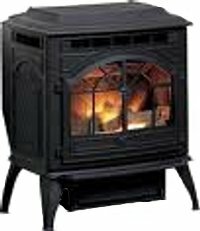 The Quadrafire Castile pellet stove has patented automatic ignition and jam-free feed systems, an aluminum heat exchanger, and a revolutionary easy clean firepot. Constructed of cast iron, the stove has a large, attractive arched viewing window which shows the herringbone brick effect steel firebox back as well as the fire with its realistic log set. The stove is available in four colours. Matte black painted finish, Mahogany Porcelain enamel, or Bronze / Willow baked powder coating. Hopper Capacity Freestanding 40 lbs. Insert 45 lbs. Burn time Freestanding 26 hrs. Insert 30 hrs. 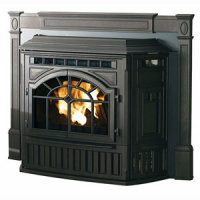 Depth onto hearth 9.75 in. into fireplace 13.2 in. Small cast iron 30 in. by 42.5 in. Medium cast iron 34 in. by 48 in. Small steel 30 in. by 40 in. Weight Freestanding 258 lbs. Insert 260 lbs. Window Size 15 in. by 12 in. Rear Vent Height Freestanding 16.1 in Insert 12.75 in. If using corn without pellets as fuel in the Quadrafire Castile, the corn won't automatically reignite unless it has some wood pellets mixed in. This means it's necessary to keep the stove on. If you would like to leave a review of the Quadrafire Castile, please use the form on the Contact Page.